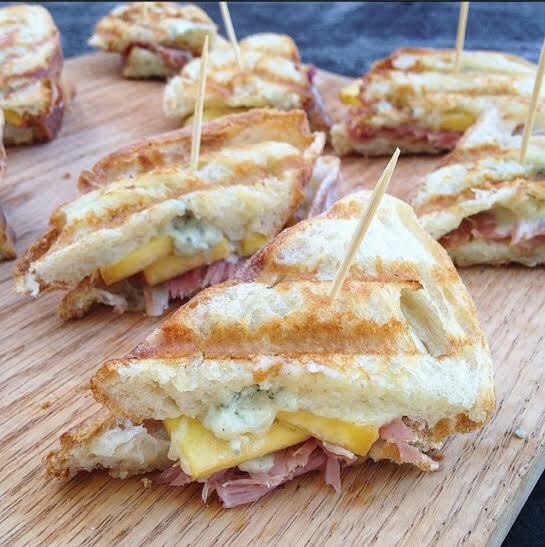 Panini sandwiches are always fun to create; from to sweet to salty or in this case both. Peaches are in full bloom right now and are one of my favorite fruits. I wanted to highlight them in this recipe giving it the perfect combination of sweet and salty. Once you take a bite into this panini your mouth will be bursting with flavors from the saltiness of the prosciutto, the creaminess and sharpness of the Gorgonzola cheese, the sweetness of the peach and the crunchy and buttery taste of the ciabatta bread. Cutting them into halves or into fours will be the perfect bite size start to any party. I hope you enjoy. Get the panini press nice and hot. Next take the pieces of bread and spread the butter on the outer part of the sandwich. Now add some Gorgonzola cheese, slices of peaches and finally one slice of prosciutto. Close the panini and put on the hot press for about 4-5 minutes, until toasted and golden brown. Oh my. 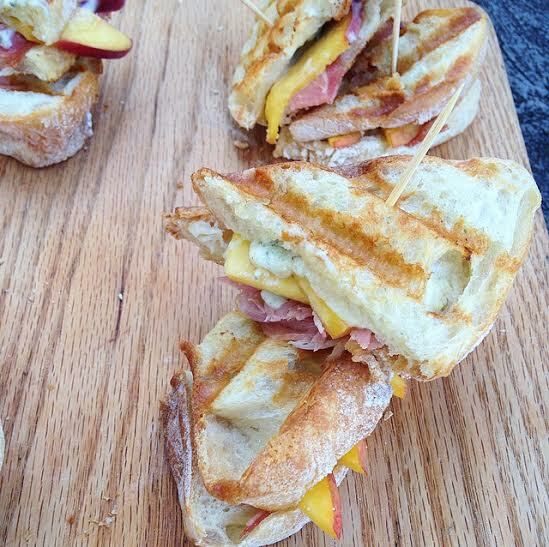 It might be just for this sandwich that I have a panini press, it sounds amazing Liz! Peach, peach, and more peach… Great ideas….